The dream of a jeans brand made in Germany had already come true a few years ago with the launch of Blaumann. 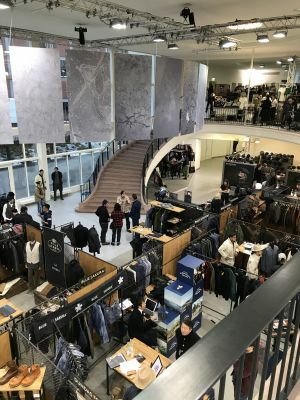 The jeans are manufactured exclusively in German clothing factories, and ingredients such as yarns, buttons and leather labels also come from Germany. But they lacked one essential ingredient: German-made selvedge denim. “During conversations we repeatedly came across the missing link, the denim woven in Germany on a shuttle loom with the corresponding weight. 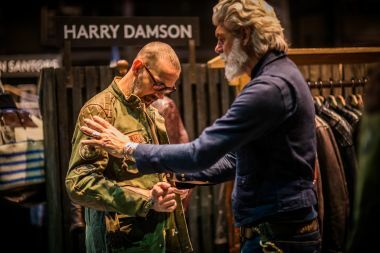 There hasn’t been anything like this before, because jeans weren’t an issue before the war and after the war the denims were first imported until they were woven much later on and off in Germany, but then on modern looms,” says Guido Wetzels, one of the makers of Blaumann and a passionate jeans expert. As Wetzels gets around a lot and knows the industry very well, he found a partner in Maibom, a company based in tranquil Hamminkeln that concentrates on finishing and refining denim that wanted to venture the experiment with Wetzels. Here he tells the adventurous story from the idea to the actual product, from the experience of starting up an old loom again to the feeling of holding the first meter made in Germany. I always had to deal with the company Maibom when it came to fabric tests. During conversations, of course, we also came back to Blaumann from time to time and in this context to the missing link, the denim woven in Germany on a shuttle loom with a corresponding weight. The historical denims woven on vintage looms come mainly from Japan, other Asian countries, Turkey and Italy. In percentage terms, these quantities play practically no role on the world market. Selvedge denim is a subject for enthusiasts. At some point Mr. Maibom said that the weaving mills they work with in Asia still had such “things” (old looms) standing around. Probably he was a little bit flirty about the story, after all the Maiboms, father and sons, are still real textile people through and through. Not even that much later he called and said, when we take the fabric from him, he will buy the loom, have it sent over and repaired. We said, “Sure, if the quality is right.” And we wanted blue and white selvedge, in the Blaumann colors. That was the simplest thing. From the moment we accepted the order to the first meter of denim, it was a good 12 months in the end. How many meters are produced per year? Is it possible to expand the capacity? At the moment we can’t estimate that. However, expansion is conceivable, as the plan for expansion was at least discussed. It depends in the end on how much fabric or trousers we will sell. How many trousers can you produce with it? At the moment the loom runs whenever Detlef, the trained weaver at Maibom, has time, so it’s not a classic shift operation. We have now weaved 600 meters. The consumption per trouser is about 2.6 meters. How much does the meter cost? How much more does the customer have to pay for Made in Germany denim? The fabric price is in the range of Japanese denims with the same weight. The trousers will cost €279 instead of our usual €249 simply because the goods are definitely strictly limited at the moment due to capacity reasons. How did you feel when you actually had the first denim Made in Germany in your hands after so many efforts? We were a bit proud. It’s always one thing to talk about something like that in “you would have to” and “it would be great” mode and then really have it in your hands at the end. The loom comes from Asia. How do the dealers like it? We presented the trousers at the Selvedge Run in July 18 and a lot of orders were placed. Actually all dealers thought it was great and not one of them had a problem with the higher price. The story is just unbeatable. In retrospect: What was the biggest difficulty with the project? For us the biggest difficulty was to put a flea in Mr. Maibom’s ear about how cool such a project is for his company. The loom had to be extensively repaired. Be honest: Was the effort worth it? The effort was clearly worth it; it’s the first selvedge denim from Germany. And if everything went smoothly, it would be boring. The first proto-blue men’s jean five years ago was technically a nightmare. Today we can laugh about it. We are trying to increase our sewing capacity in Germany, which turns out to be a real problem. Denim clothing is already very special when it comes to the machinery and there are hardly any companies left that can really do that or have the machines. Recently you have also added a women's model to the collection. How has this been accepted? The women’s model is doing quite well, but at the moment we are only making a small series. The men’s models are more important for the trade, and at the moment we mainly have to distribute the sewing capacities among them. But here, too, we will be expanding and experimenting with fabrics. At the moment, however, only in 100% cotton, slightly pre-washed for the final wash cycle. The price, as with the men’s models, is €249. Shane Brandenburg, Selvedge Run: "We do not lose our identity"